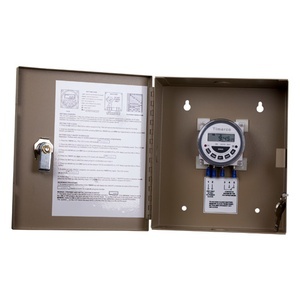 This 7-day programmable time clock can be used to control up to 8 on/off events per day from a selection of 15 daily program combinations. The iO-TC is powered by 24VAC and has a self-charging lithium battery to maintain the real-time clock schedules in the event of a power failure. The iO-TC comes in a metal enclosure with key lock and conduit knock-outs located on the top, bottom and sides for ease-of-installation.